We have a series that gives you tidbits of useful information as it relates to getting a new dog or caring for the one you currently have. As pet parents, we’re in it for the long haul so we want to share as much information to you for your pet’s care. If you’re a potential pet parent, before you buy a dog have you considered the clean-up process? It covers everything from picking up poop, to cleaning up accidents, disinfecting toys and cleaning bed linen, and having proper food storage and proper temperatures! Phew…we know that’s a lot, but it’s a less than gentle reminder of the various responsibilities. In order to reduce shedding, you should brush your dog regularly. This applies to dogs who are prone to shed most likely. Bathing your dog will keep your puppy’s coat clean and shiny and healthy. Most dogs don’t need to be bathed more than a few times a year, if you can believe it! Too many baths aren’t good for them, because they can cause dry skin and consequently discomfort for your pup. In between baths, you can wipe down your pup with pet-friendly wet cloths. This will freshen ‘em up! When you buy a dog, you will always need to pay attention to your dog’s behavior and make a note of anything abnormal. Visit a veterinarian if your dog is sick or injured or otherwise off. Make sure your dog is up-to-date on vaccinations and heartworm preventative medications. Flea and tick prevention should be part of the wellness plan, too. We can’t stress this enough. Brush your dog’s teeth at least twice a week. If you can’t do it, make sure that you give your dog bones that are made to clean their teeth and satisfy their gnawing desires. Your dog’s dental health is just as important as the rest of his body. Yikes! The sight can definitely be off-putting, but those buggers exist and it’s not uncommon for dogs. Dogs who reside in urban areas aren’t off the hook. They can get them too. There are several types of worms and a few microscopic parasites that typically affect dogs. 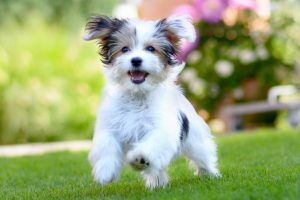 Most puppies, even those born from healthy mothers may have roundworms or hookworms. 7 “Schnazzy” Schnauzer Facts from Petland Sarasota!